Green tea has recently emerged as a healthy alternative of normal tea. Even some doctors have started prescribing green tea. A number of people are already using it for weight loss. Is there are truth in all those beliefs. Some people think that drinking a tea without sugar or milk, reduces the daily intake of excess calories, which results in weight loss. Some believe that it is the placebo effect that improves health and some other activities done along with green tea, which reduces the weight. We will try to find which of the above statements is more valid. Most of the people don't know the fact that both green and black tea are produced from same plant named Camellia sinensis. Their color is different due to the processing difference. In production of Black Tea, the leaves undergo crushing and fermenting process, which causes its different flavor. Green Tea is not fermented. Some people think that green tea is caffeine-free, while it is not. Both types of these teas contain antioxidants. Types of antioxidants may differ, but both are beneficial. According to a research both types of tea contain 10 times more antioxidants than fruits and vegetables. Some researchers have proved that tea improves metabolism and helps in removal of toxins from body. Both Green and black tea blocks the DNA Damage caused due to smoking, which reduces the chances of cancer. Biggest proof of this finding are nations like Japan, which are considered as the biggest tea drinkers. Cases of Heart Diseases and Cancer are comparatively low in these countries. However some people disagree with this fact as less cancer risk is also connected to lesser obesity in Japan, which is a direct factor for heart diseases and cancer. Some people believe that lesser obesity in Japan is due to popularity of tea. This fact might be the one which made people think that green tea decreases obesity. Here we should not forget that people of japan are also known for their hard work, which is also a factor behind lesser obesity. 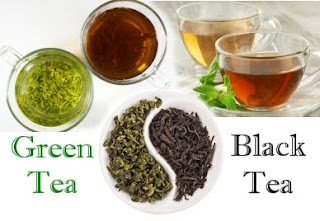 Why Green Tea is considered better than Black Tea ? The basic reason is that green tea is less processed. Today people tend to go towards herbal, which means less processed. So green tea is getting more popular as something herbal and more natural. Second reason is the preparation method. Preparation of black tea includes other ingredients like sugar and milk, which increases the calorie value. But green tea preparation don't need any other ingredients, which keeps its calorie value low with same amount of antioxidants. Third reason is its taste, which is considered better by most of the people even without using sugar. Back tea is slightly hard to drink without sugar. Some researches have also shown that usage of green tea reduces weight, protects you from several types of cancer, delays onset of diabetes and many more. Last and the best reason is that green tea is recommended by dietitians and medical practitioners. Does Green Tea help in Weight Loss ? Yes it does, but how ? The very first thing that green tea do is improving your metabolism, which reduces the chances of fat deposition. Second factor is usage of no sugar in preparation of green tea, so no extra calories. Third thing is motivation. Usually a person who is using green tea, also implement some other dietary changes to reduce weight or lifestyle changes such as regular workout. These activities also help in weight reduction a lot. Now you know that both green and black tea are good for health, but green tea have some added benefits. When it comes to weight loss, we would suggest you to balance your diet and improve lifestyle along with green tea to get better results in lesser time. 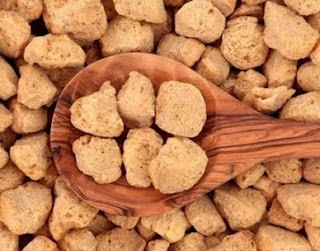 While researching on this topic we came across a number of article claiming merit and demerits of soybean chunks. Some claim it as a good source of protein, while some claim it as a cancer causing food. Some people say that they have eaten soya chunks all of their life and nothing bad has happened, while some presented links to studies that claim that soy oil contain pseudo-estrogen and isoflavones which are bad for health. Betterhealthfacts.com tried to understand and bring the truth of such claims for our readers. We found that there are some researches done on soybean oil and soy products and most of them claim it to be unhealthy especially for men. But companies manufacturing the soy products advertise it as the vegetarian food with more protein than a non-veg diet, but they don't tell about the other unhealthy factors. Some nutritionists advise people to avoid soy foods if they are struggling with low thyroid problems. Most of the researches claim soy food to be bad for men and good for women. Consuming it in a controlled way may save you from any adverse effects. Especially men should not eat it too much to gain some protein. What makes you Fat ? Carbs, Fat or Calories ! Obesity is the latest epidemic and threatening US population with side effects like heart diseases and diabetes. People take it as a lifestyle disease and think that lack of physical work is responsible for that. But the truth is that our diet is also a major factor, which is making us fat. Those who are aware about diet have got various views. Some think that excess fat in diet makes us fat, while some think that excess carbs do it. One more group of people think that it is all due to excess calories. Here we are more concerned about diet, and will try to find which factor (fat, carbs or calories) is to be blamed for making us fat. 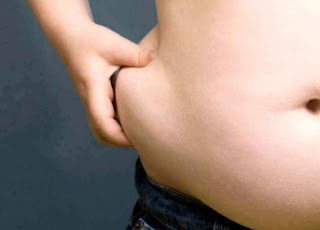 What made people believe that Fat in diet is real culprit ? There were some widely spread myths that even educated people believed in and thought that dietary fat makes us fat. Myth 1 : Dietary fat directly get deposited in body and make us obese. Truth : Our body can't do that. First is digests the dietary fat like any other food item. Our stomach only absorbs water and glucose for instant energy (that is why we give glucose to drink, if someone faints). Infact dietary fat takes more time to get digested and make us feel full for longer duration. Myth 2: Fat contain more calories that makes us fat. Truth: Yes, dietary fat contain 9 calories per gram, while carbs and protein contain just 4 calories per gram. But the truth is that this property of fat makes us feel full on lesser consumption. As we told earlier that digestion of fat takes longer and makes us feel full for longer duration as well. Both of these facts automatically balances the correct amount of calorie consumption. Here you should know one more thing that digestion of fat consumes far more number of calories compared to carbs and proteins. If you want to know more about Fat Myth then read Does eating Fat make you Fat . Are Carbs responsible for Body Fat ? Carbohydrates are more easily convertible to body fat compared to dietary fat. Carbohydrates can be more easily converted to glucose and increase blood sugar level and insulin level. The excess glucose which is not absorbed by muscles and other cells of body are converted into fat and deposited in different parts of body as a stored energy which can be used by body while is shortage of food. So the real fat deposited in body is made from carbohydrates. Bread, potatoes, cookies, sugar and rice are some major sources of carbohydrates that you should control in your diet. Now people are turning towards Ketogenic Diet , which is a low carb diet, to loose the excess fat and being slim. Can you blame calories for Body Fat ? Yes, but only if you are consuming more than the expenditure. In the end it doesn't matter what you are eating, what matters in the amount of calories. If you are consuming excess calories then in the end they will get deposited as fat in body. Physical activities are the best way to consume calories. You may choose any one that you like such as cycling, jogging, swimming or workout in a gym. Staying away from more carbs is better as they contain instant calories and it also makes us addict. A balanced diet and active lifestyle that includes some daily workout is the best way to stay fit. What is Mineral Oil ? Mineral oil (also known as White Oil) is a liquid byproduct of refining crude oil which is used to make gasoline and some other petroleum products. It mainly contain alkane and cycloalkanes. Its density is around 0.8 g/cm3. Term "Paraffinum perliquidum" is used for light mineral oil and "Paraffinum liquidum" or "Paraffinum subliquidum" for thicker varieties of mineral oil. It is a transparent, colorless and tasteless oil. It best property is that it is inexpensive, which made it widely popular among a number of industries. Veterinarian use it as a mild laxative for pets. Mineral Oil is a common ingredient in baby lotions, cold creams, ointments and cosmetics. It is used as a lubricant in enema, as most of it comes out as the stool rather than being absorbed by the body. Mineral oil is rubbed on wooden kitchen items in hotels and restaurants, as it reduces the absorption of food liquids into them and thus making them easy to clean and no food odors. It is used as non-conductive coolant in electrical components such as transformers. So transformer oil is actually mineral oil. Mineral oil and detergent are mixed to make Horticultural oil, which is sprayed on plants to suffocate pests and reduce their population. In textile industry light mineral oil is used as spindle oil (a lubricant). It is also used as brake fluid in disc brakes of some bikes and cars. Mineral oil is extracted from crude oil, which itself contain various toxins and some carcinogens. Mineral oil is considered as comedogenic (which clogs pores on skin) and may result in acne. However cosmetic companies claim that they used highly purified form of mineral oil, which is non-comedogenic. According to WHO (World Health Organization) untreated or mildly treated mineral oil comes in Group 1 carcinogen. 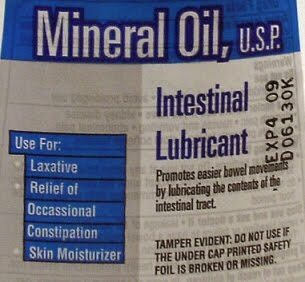 Due to its laxative effect, usage of mineral oil in children's foods is discouraged. 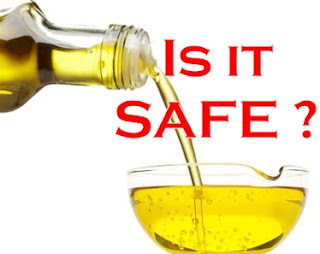 Maximum permissible limit of consuming mineral oil is 100 mg per day, but our baking industry alone is responsible for making us ingest 80 mg per day, as mineral oil is widely used there. Mineral oil as an ingredient of hair oil to act as a cheap lubricant. Some studies have found that usage of mineral oil in hair oil may impair the healthy growth of hair. Mineral oil-based moisturizers can increase the growth rate of tumours. According to cancer.gov mineral oil exposure increases the risk of nonmelanoma skin cancer, particularly of the scrotum. 22% of all petroleum based cosmetics contain "1,4 dioxane" which is an animal carcinogen and a possible human carcinogen as well. According to a study published in Women's Health in 2011, 142 women who were undergoing C-sections were tested for body fat and post-delivery milk samples. Researchers found that both fat and milk were contaminated with MOSH (mineral oil saturated hydrocarbons). So next time you read these labels, decide it yourself either you want to use that product or not. Some experts say that only unpurified mineral oil is harmful and carcinogen, while purest form of mineral oil is OK for health. But why should we use it when we already know that it was derived from a harmful substance. Half a century ago soy, safflower and linseed oils were used to make paint and varnishes, but then chemists discovered technique to make it from petroleum oil, which was cheaper. At that time due to lack of any merchant to purchase their crops, farmers fed the soy and safflower to their pigs. As a result the pigs got fat. Then scientists developed a technique to purify the vegetable oils and remove their paint-like bad smell, and that process was used to manufacture refined oils. Now these vegetable oil became taste less and odor-less and widely accepted by society, as even doctors of that time preferred it over animal fat (such as butter). Refined vegetable oils were also cheaper than other traditional animal fat derived from cow milk. The oil once used for making paints and later used to fed pigs is now being used in our kitchen. So the question is if the refined vegetable oil is healthy or not ? What is a refined vegetable oil ? Refined vegetable oil means vegetable oil that has been "purified". Here purification may mean a number of treatments, such as filtered, deodorized, neutralized, treated with acid, purified with alkali or bleached. Natural antioxidants and nutrients are also removed from vegetable oil in the process of purification. Such treatment of any food product can make it unhealthy. Some refined vegetables oils also undergo hydrogenation, which turns oil into solid state and increases its shelf life. Such hydrogenated oil contains a large percentage of trans-fat, which is considered very unhealthy. According to an estimate by FDA more than 90% of prepared cookies, crackers and frozen breakfast contain trans fats. Such readily available food items and food served in restaurants usually contain hydrogenated vegetable oil, which increases the profit but degrades the health. Next time when you purchase any packed food, check its ingredients if it contain trans fat. Do you known that New York became the largest city in US, where restaurants are asked to go trans-fat free. Soybean oil (used in 75% of American Kitchens) increases obesity, which is directly linked to heart diseases and diabetes. Since introduction or refined vegetable oils in 1960s , the reported cases of heart diseases and cancer has increased tremendously. 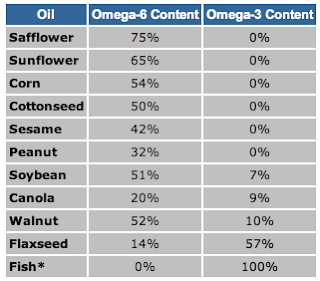 Soybean oil creates imbalance of Omega-6 and Omega-3 in body. Each table spoon of soybean oil contain 6807mg Omega-6 and 917mg Omega-3, while it should be in our body in equal amounts. Omega-6 creates inflammation, which is sometime necessary to heal cuts and wounds. But overdose of omega-6 creates unnecessary inflammation, which can cause a number of health issues. Note: Before starting to use any new vegetable oil, make sure that you know how it is made and what are its effect on health. Your awareness can save your health and also your medical expenses. 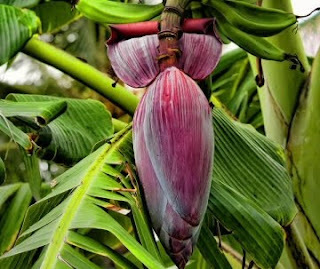 Banana Flower, also known as Banana Blossom or Banana Heart, is highly nutritious and often eaten as a vegetable and salad in some Asian countries. It is a maroon or purplish flower, that hangs at the end of banana clusters. They taste starchy and bitter. It has got various health benefits, which are described here. Calcium, Phosphorous, Iron, Copper, Potassium and Magnesium are the minerals that are found in Banana Flower. Vitamin A, C, and E are also present in banana flower which increases its nutritional value. Prevent the pathogenic bacterial growth, thus preventing any suspected infection. This banana recipe is made in some parts of India and considered very healthy, especially for diabetic patients. Put some oil in pan and heat it. Put some mustard seeds in it till it crackles. Add ½ tsp. of urad dal (split mungo bean or black gram) and channa dal (split black chickpeas) to it till it becomes brown. Add the chopped banana flowers. Set the flame to low and cover the pan for few minutes. Keep checking till all water get evaporated and then switch off the flame. Now the recipe is ready to be served. 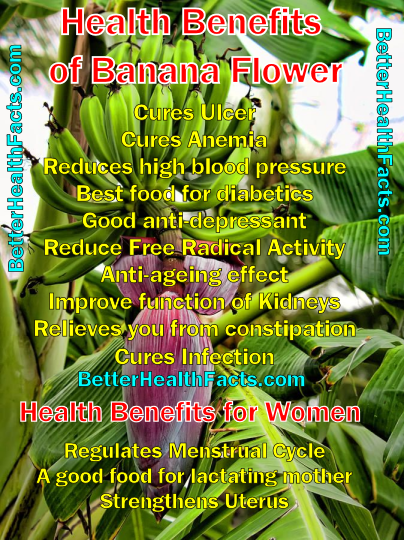 Save this image and share it to make your family and friends aware of the benefits of banana flower. Does eating Fat make you Fat ! Are you fed up of sacrificing your favorite dishes, just because they contain fat. Now the time has come to debunk the low-fat diet myth and let you eat your favorite butter and cheese. Harvard School of Public Health published an article named "It’s Time to End the Low-Fat Myth" to let people know about the unhealthy diet schedule that some health conscious people were following to save themselves from obesity and heart diseases. Some recent researches have found that instead of having any positive effect on health, low-fat diet was actually degrading the health. Does eating Fat make you Fat ? Fat has got more calories per gram, i.e. 9 calories, while carbohydrate and proteins have just 4 calories per gram. 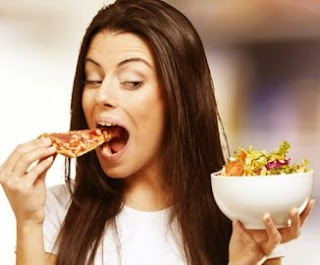 It made some old researchers think that eating the similar weighing diets with more dietary fat will put more calories into your body, but if you go for low fat diet then you will get benefit of lesser amount of calories and feeling of full tummy. For past few decades a number of doctors continued to recommend low fat diet to save their patient from obesity, diabetes and health problems. But this misconception was proved totally wrong in some of the recent researches. Do you know that a healthy women should have 27% body fat and a man should have 15% body fat. Why do women have higher body fat ? So adding some saturated fat to your diet won't harm at all. Instead you will find that your lipid profile reports are improving, especially if your were on a low-fat diet earlier. 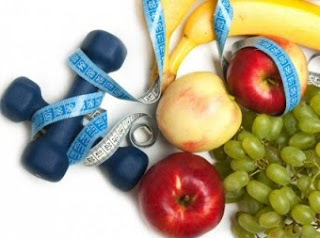 If you were on a low-fat diet to reduce weight then you must know that low-fat diet has no connection with reducing weight and it can't make you slim. If it is not Fat, then what makes you Obese ? Why does Fat don't make you Fat ? When we eat fat, it consumes more calories in digestion and takes more time to digest. So eating fat consumes calories and also keeps your tummy full for longer duration. So fat-rich diet ends up in eating less due to feeling of satiation. It helps in consuming a calorie restricted diet. Note: While deciding your diet plan, make sure not to end up consuming excess calories. In the end it is the excess calories that can cause weight gain. Consuming a balanced diet can help you in maintaining a good height to weight ration. "Controlling the Fire" is one of the most important discoveries that evolved us to be Homo sapiens, the latest and best species on earth. The best proof of the above fact is that no other species eat cooked food, as they tend to run away from fire. Even the strongest wild animals run away from fire as they are fearful of it. But human ancestors learned the art to control fire and that fear was long gone. This art helped us in roasting the meat and then cooking the food. But how does cooking helped us in evolving as humans ? You will get an answer to this question in this article. 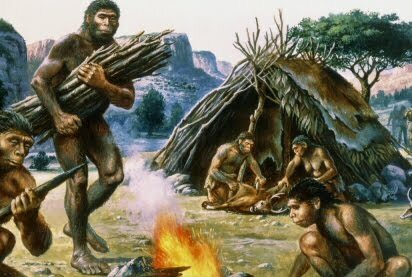 Our ancestors like monkey, chimpanzee and apes used to eat raw veg food gathered from plants and tree. Their body used to struggle hard to extract sufficient energy from that type of food. If you have studied biology then you must be aware of the fact that plant cells have cell wall, known as cellulose, which hard to digest. That raw veg food made our ancestors eat more and increased their gut size. Chimpanzee and apes have got 60% bigger gut then humans only due to this fact. As our ancestors were eating more so they need to keep searching for food, which was not only time consuming by also making them deficient of calories. As their brain was not getting sufficient calories, it was not developing as much as it should. A developing brain also needs some time, that it can spend in some creative activities, but it was impossible to get due to their always searching and eating schedule. Do you know that gorillas and orangutans keep eating for nine hours per day. In the beginning our ancestors diverted from veg to non-veg diet as it was richer in calories and kept them full for longer duration. It made them indulge in other creative activities and during that time we learned to control fire. 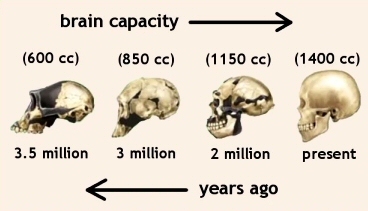 It was a milestone in human evolution. How Fire helped us in evolution ? As the time progressed we learned to eat roasted food, which made both veg and non-veg food easily digestible. Heat made the food softer and lesser time was spent in chewing. We started to extract more calories from same food and got more time to explore more and develop our brain. Our brain also started to get sufficient calories and nutrients to develop itself. Heat treated food was also safer, as a number of pathogens were killed by heat and there was lesser chance of food poisoning. It must have given our ancestors relief from some diseases. Fire also acted as a tool to save ourselves from wild animals and our ancestors started to live on land. Fire also helped in making tools, that were later used to cut woods and make a good habitat on land. Fire was also used to make utensils of soil and mud, which were used for cooking and storing purpose. 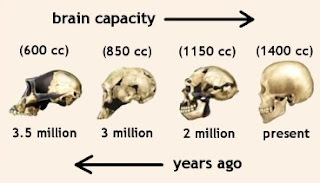 Evolution of Agriculture made humans store grain and provided them a food security. It gave them relief from hunting schedule and they reverted back to a mixed diet of both veg and non-veg. Fire helped them in cooking the cultivated food and made stay at a single location. It also made them using some cattle as their pet, and utilizing their milk. Cooked food reduced the size of our gut by 60%, when compared with our ancestors of similar stature. Even the size of our intestine has reduced. It is because of the fact that cooked food is easily digestible and consumes lesser time and lesser calories for digestion. Our smaller teeth and jaw tell about the same evolution attributed to cooked food. Today we have evolved so much that we can't survive on raw food alone, as we don't have bigger jaws, teeth and intestine to extract sufficient energy from it. Now our digestive system and enzymes is designed to eat cooked food. Some uncooked salad won't hurt. Sometime people tend to go towards completely uncooked food, with no salt and sugar, to be slim and get more near nature and live a disease free life. Such steps can sometimes have a negative effect on your body. So don't be your own doctor and always consult a good dietitian before making any drastic changes in your diet. Note: Today we have become so good at processing food, that we are eating more calories than needed. It is affecting the whole humanity with a disease named Obesity. Human Diet has changed a lot during past few million years and some major changes were made just few thousand years ago after evolution of agriculture. But does those changes have any impact on development of our brain. Human are the best race on earth and ruling the planet only due to superior brain. Nutrition plays an important role for our health and brain, and understanding the evolution of human diet can help us better understand this topic. There is a belief that we are not evolved to eat what we are eating today. Here we will try to evaluate that how much of such belief is valid. A few scattered tribes of nomadic hunter-gatherers are still living on our planet and they are still using the same diet as their ancestors did thousands of years ago. Researches on these people found that they don't develop high blood pressure, atherosclerosis, or cardiovascular disease. Does it mean that diet of those nomadic hunters is still best for us ? Dairy products, beans and cereal grains were introduced into our diet after invention of cooking and agriculture. Why did humans started agriculture ? Agriculture provided us a reliable source of food, that we can store for years. It gave us relief from risky hunting schedule. Cooking made cultivated vegetarian food easily digestible and made us extract enough energy from that. It made humans settle at a location instead of roaming all over and grow their families. After evolution of agriculture the birth cycle get reduced to 2.5 years from 3.5 years, which increased human population. Agriculture made humans a social animal. It gave us sufficient time and opportunity to develop other skills which evolved our intelligence. Most of the scientific developments in human history happen only after evolution of agriculture. So it must be the key. In the process of evolution humans have changed their diet a lot from veg to non-veg and then back to a combination of both. Now humans are eating a wide variety of food. We have got both types of teeth which suits both veg and non-veg diet. Instead of giving logic to say that our diet is better, we should understand that humans developed due to these changes in diet and we are fit to eat any type of diet, depending on what is available around us. You can't expect a person living on poles to survive on vegetarian diet as it is not available there. Note: Today no vegetarian is dying due to lack of nutrition and they are getting sufficient calories to power up their brains. Non-vegetarians have got their own logic and vegetarians have their own logic to prove their diet better. But the truth is that we eat what our families have eaten from past few generations. Even if you tell someone that their genes tell that their ancestors were nomadic hunters, he/she won't start eating like them. It is because our present beliefs, religion and emotions won't allow us do that. Most of us stop worrying about purity of water after installing a RO water purifier, which is an essential part of modern kitchens. The truth is that we never care about the TDS value of the output water. In 1980 WHO published a research paper which said that low TDS water is harmful for human body. Today we are drinking water packed in plastic bottles with very less amount of minerals in it. In our last articles we discussed how this low TDS water is acting as a slow poison for our body. 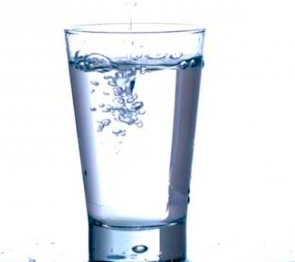 Here we will tell you about the appropriate TDS value of drinking water to live a healthy life. TDS value of water differs from one geographical region to other depending upon the minerals in the soil and their solubility. Therefore TDS value of water differs from 30 mg/litre to 6000 mg/litre. If you talk about the taste of water with very low TDS then its taste will also be unacceptable due to its flat and insipid taste. You may find the above information in a WHO document on the following page. "If it tastes good then it is healthy"
Some of you might not agree with the above statement but some will. If you have got a healthy body then your tongue can better decide what your body needs. The nutrients that your body needs will be found tasty by your tongue. However it might not be true if your are suffering from some medical condition such as diabetes, where psychological factors make you like those things from which you should abstain yourself. For a healthy human being tongue is the best testing kit for nutrients. If you are finding the water tasty enough to drink then most probably it will be of correct TDS value. We don't encourage people to stop drinking purified water, but to make them drink water of correct TDS value that can provide them sufficient amount of minerals. When we talk about poison, we take it as a organic or inorganic compound that can kill us within a certain time. Here we are comparing low TDS water with slow poison. Some of you might not be aware of that, but it is a reality. Several researches have confirmed the health hazards of low TDS water. These hazards are listed in detail in this article and it will open your eyes about the severity of this issue. In our previous article we revealed the fact about how leaching capability of water increases by reducing its TDS, which is usually done by most RO water purifiers. How does low TDS water become more reactive? TDS means total dissolved solids, which includes minerals and other organic ingredients (such as some bacteria and other micro organisms) dissolved in water. These solids dissolved in water make it stable and unable to leach anything else from the containers. When TDS is lowered using RO water purifiers the reactive capability to leach chemicals increases. It makes that water absorb solids from the nearby environment such as its containers or the air coming in its contact. Low TDS water become a slow poison if its nearby elements contain any such chemical which is harmful for health. How does leaching capability of water affects our health? Plastic: We all know that plastic is harmful for health, but we don't take it seriously. BPA is a harmful chemical compound present in plastic. It might harm us less when normal water is stored in it, but when you store low TDS water in it then due to higher leaching ability more BPA can be absorbed by that water. If you have a RO purifier then please notice the container. Is it made up of plastic or something else. Most of the RO purifiers use plastic containers. BPA can cause infertility in men and hormonal imbalance in body. It is severely harmful for fetus and infants. Heavy Metals: If the Low TDS Water is coming in contact with metal, such as a pipeline or a metal container, or the nearby air, then it can absorb some heavy metals from it which can affect our health later. If calcium and magnesium are present in water then they protect the water from absorbing heavy metals like lead and cadmium. Low TDS water have lesser amount of calcium and magnesium and makes that water prone to absorbing heavy metals. Leching of minerals from body: Yes, Low TDS Water can leach minerals from our own body. Instead of providing some minerals to our body, this water can leach minerals from our body and drain them out through urine which can make our body mineral deficient. Sodium and potassium are the main minerals leached in this process, which are necessary for proper functioning of our nervous system. Stop using the plastic containers for your RO water storage. Don't store the RO water for too long as by the time time you drink it, it would have done sufficient leaching. Most important is to keep the TDS level of your RO high enough to provide you sufficient nutrients. If you want to know how much TDS level should be appropriate to drink then read our next article. 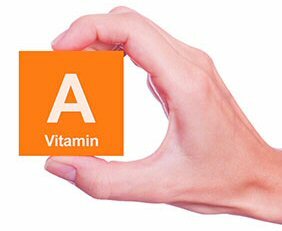 Vitamin A in Excess can be fatal ! Vitamin A is an important nutrient for our eyes and normal body growth of children. But excess amount of Vitamin A can be fatal as well. However it occurs very rare and only due to our own ignorance. It can negatively affect our liver, kidney, brain, bones, eyes and skin. This lists of organs is sufficient to make you understand the importance of correct amount of Vitamin A in body. Betterhealthfacts.com have collected some facts to tell you about the toxic effect of excess vitamin A in our body and how it can be fatal. Our body can't get rid of excess vitamin A itself as it is a fat soluble vitamin, not a water soluble vitamin. Excess amount of water soluble vitamins can be flushed out of our body through urine, but it can't be done with fat soluble vitamins. So the excess amount of vitamin A is stored indefinitely in liver and other fat deposits inside our body. The excess amount of vitamin A in our body can be diagnosed by blood test. 700mg of Vitamin A per day is sufficient for an average woman and 900mg for a man. However a pregnant woman or a breastfeeding mother need slightly more amount. If you are having a balanced diet then you don't need to worry about it. But if you are suffering from some disease and getting some vitamin supplements then you should stick to the prescription by the doctor. Don't try prescribe vitamin supplements for yourself, as its the most common reason for Hypervitaminosis. Hypervitaminosis-A is the medical term used to name the disease of excess amount of vitamin A in our body. There are two types of this condition, one is acute and second in chronic. Acute Hypervitaminosis-A occurs if very large amount of vitamin A is consumed in a short span of time, while Chronic Hypervitaminosis-A occurs when more amount of vitamin A is consumed on daily basis and very high amount of it is stored by our body after a few weeks or months. Both of these conditions have different symptoms and treated accordingly. Megavitamin Therapy which involves consuming very large doses of certain vitamins to prevent or treat some diseases. Can Hypervitaminosis-A be fatal ? Hypervitaminosis-A can cause liver damage, osteoporosis (weakness of bones). Kidney failure may also occur due to excess calcium buildup. All these condition are fatal. In children it can easily cause coma due to swelling in brain. If the condition is not diagnosed and treated on time then it can be either fatal or create a life threatening condition. Treatment of Hypervitaminosis-A is done by completely stopping the vitamin supplements and stop taking Vitamin A rich food items. It takes time to recover and in the mean time other symptoms are treated individually. Recovery time depends on severity of your condition and how soon it is diagnosed. Most of us are aware of basic nutrients that a human need to survive such as protein, vitamin, minerals, fat and sugar. But most of us don't know about carotenoids, and why do we need them in our diet. 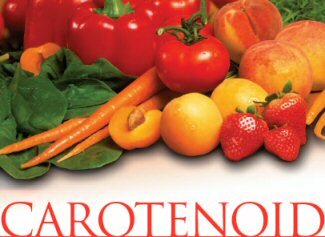 Betterhealthfacts.com will tell you here about these carotenoids and why they are very necessary for living a healthy life. Carotenoids are organic compounds mainly found in plants and algae. They are responsible for red, yellow and orange color in various fruits and vegetables. They absorb sunlight for photosynthesis and protect chlorophyll from damage by sun rays. There are 600 different varieties of Carotenoids but they can be split in two different classes. One is Xanthophylls (which contain oxygen) and second is Carotenes (these are pure hydrocarbons, and contain no oxygen). Aphids and Spider Mites are only animals with ability to produce Carotenoids due to genes acquired from fungi. Carotenoids are very important part of a balanced diet. Their presence in our food save us from various disease of eye and certain types of cancer. 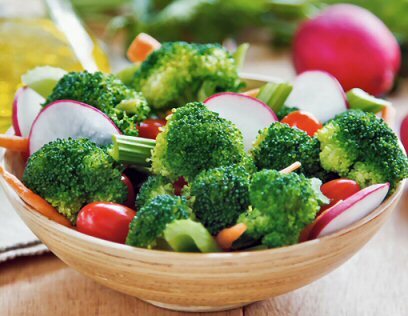 Role as Antioxidant: Carotenoids in our diet act as antioxidants, which as well known for their anti-cancer properties. Can be converted to Vitamin A: Beta-carotene, a type of catenoid can be easily converted to Vitamin A by our body. Vitamin A is good for our eyesight and normal growth. But excess amount of Vitamin A is also harmful for our body, so a balanced amount of beta carotene should be consumed. Saves us from Cancer: Some studies have suggested that carotenoids may help in prevention aganst skin, breast, and prostate cancer. A review done in 2015 found that carotenoids may protect us from head and neck cancer as well. But some recent studies have shown negative effect of beta-carotene in connection to lung cancer. More researches are still being done. Improves our Vision: Some carotenoids such as lutein, astaxanthin, and zeaxanthin protect macula of retina from blue and near-ultraviolet light by absorbing it. Thus it saves that part of our eye which is responsible for sharpest vision. Saves skin from tanning: Carotenoids not just save our eyes from sunlight but our skin as well. Carotenoids from save our skin from tanning and keeps it more healthy and glowing. carrots, sweet potatoes, yams, papaya, watermelon, cantaloupe, mangoes, spinach, kale, tomatoes, bell peppers and oranges are some of the best sources of carotenoids. Carrots are considered best among them. So make them a part of your balanced diet and live a disease-free life. Do We Absorb 100% Calories / Nutrients in Food ? Such a question might have raised in your mind some day. Every engine have an efficiency rate. There is no engine with a 100% efficiency rate. Then how can a human absorb all the energy stored in the food ? Is our stomach the only place where calories are absorbed ? If we can't absorb the 100% Calories then how do food manufacturers write nutrient information on packets ? If we totally depend on that information then it might make us suffer from malnutrition. Here betterhealthfacts.com will try to answer such questions with true scientific answers researched from internet. Do We Absorb all Calories and Nutrients in Food ? We absorb 10 to 90% of nutrients and calories from a food depending on the factors written above. But on an average we absorb 85 - 90% of calories and nutrients from our diet. Our body can itself change its absorption rate depending on its need. Sometimes it can avoid the absorption of a nutrient which is already in sufficient amount in body. 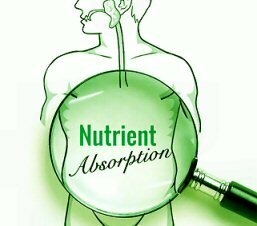 But sometimes it becomes more efficient in absorption of a particular nutrient if there is any shortage of that nutrient. Note: Our eating habits also make impact on nutrient absorption. An article about Acidity and Antacids published on Betterhealthfacts.com will put some light on this particular topic. Its a must read for all health conscious people. How does time of the day affect calorie / nutrient absorption ? All other factors written above make some sense, but how do the time of the day affect the absorption. Our biological clock or circadian rhythm, a 24 hour cycle in our brain affects our absorption rate. Some enzymes and hormones reach their peak at different times of day and help in absorption of different nutrients. For example parathyroid hormone, which helps in absorption of calcium, reaches its peak during night time. Due to that reason some people suggest taking milk before going to bed, as it can help in better absorption of calcium from milk. Is our Stomach the only organ responsible for nutrient absorption ? No, Stomach is a part of large digestive system in our body. Every organ starting from mouth to large intestine play an important role in the absorption of nutrients. Our mouth produces saliva and mixes it with food to break it down, further stomach mixes and churns it and breaks carbohydrates proteins and fats. But the main organ to do absorption is small intestine which absorbs amino acids, fat, proteins, cholesterol, vitamins and minerals such as calcium, magnesium, iron, chloride, sodium, zinc and many more. Further large intestine absorbs remaining water, sodium and potassium. Fiber in the food remain undigested and helps in bowel movement. Where are the calories lost and remain absorbed ? Some calories are consumed by the bacteria living in our gut. Some calories are flushed out through urine. Some calories remain absorbed from the food due to various factors listed above. But still all of the above wastage of calories only account for a maximum 10% loss. Acidity and Antacids can greatly affect the absorption of nutrients. You may read our article Acidity and Antacids are making you Unhealthy for more information. If we can't absorb the 100% Calories then how do food manufacturers write nutrient information on packets ? You can't check nutritional value of each food product before packaging, so the manufacturers just print the average value from their database. Apart from that the duration from which that food product is lying packed in the packet also affect its nutrients. Can we stop / reduce calorie absorption ? Yes we can do it up to some level. There are various food items that can both enhance or reduce the absorption of some nutrients. But most of us eat them unintentionally. If you will try to do it intentionally in order to reduce calorie intake, you will harm yourself by reducing some important nutrients in your body. If you want to do that to reduce your weight then its better to get your diet planned by by dietitian. Here we have mentioned some food items that affect the nutrient absorption. Tea or Spinach can reduce / stop the absorption of calcium and iron from the foods that we have just eaten, due to presence of oxalates in them. Olive oil can enhance absorption of carotenoids, which is an important nutrient for good health. Phytic acid found in some grains and legumes can reduce absorption of minerals. If you are on dieting, then rely of a single food to reduce your weight. Have a balanced diet by changing the fruits and vegetables so that you get all nutrients. There is an assumption by some food experts that some foods consume more calories in their digestion than what they provide to our body. This assumption make them believe and say that these specific foods have negative calories. However there is no scientific evidence to support such assumption. But still these specific foods become an important part of diet-chart of those who want to lose some weight. Even if these negative calorie foods are not really negative, but still they provide very less amount of calories to our body and may be beneficial in weight-loss. Here we are providing a list of so called Negative Calorie Foods with their calorie value. Do Negative Calorie foods really help in Weight loss ? Yes, they do. These negative calorie foods have very less calories, so they can easily satisfy your appetite without getting more calories into your body. Thus they help is reducing weight as advertised by most weight loss programs. Do Chilled water have negative calories and it helps in losing weight? The straight answer is NO. Some people try to be over intelligent by falling prey to this myth that Water has negative calories. Myth : Water has zero calories. One you drink ice chilled water, our body rises its temperature by burning some fat calories, which helps in weight loss. Truth: Our body burns just 10 calories in rising the temperature of 5-6 glasses of chilled water to make it equivalent to body temperature. In this way it would take a year to burn one pound of fat, which is a negligible amount if you really want to lose weight. 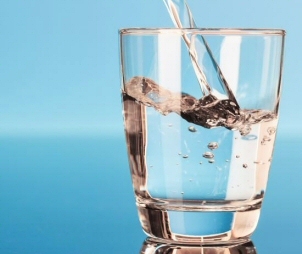 Side effects: Ice chilled water can do more harm to your throat. It can also make you sick if you do it in winters. Some people drink more water than required just to lose weight and fall prey to water intoxication, which can cause disturbance in brain functions. Very soon betterhealthfacts.com will provide a free pdf to help you in weight loss. Most of the articles in that pdf will help you understand the basics of fat deposition in our body and you can reduce the extra fat. If you want to add a few more foods in the negative calorie foods list provided above, then tell us the names of those foods in the comments section. We will try to add them in the list provided above. This calculator will calculate the calories needed per day to live a healthy life. It calculates your caloric demand on the basis of your gender, weight, age and activity level. The result shown here will also tell the nutrition in your diet for a balanced diet. If you maintain that balanced diet then you will neither loose weight nor gain. 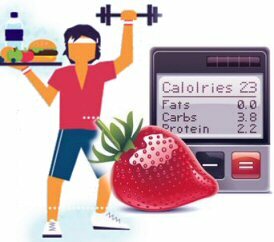 How to use this Calorie Calculator to reduce weight ? If you want to reduce the weight, then decide the weight that you want to achieve. Write that weight in the above form and calculate again. The result that you get now is appropriate for that weight. Just decrease you diet to the level given in the result, and your weight will decrease gradually. It will not happen just in few days, but it will take time from weeks to months depending on the weight that you want to loose. What is Glycemic Index ? Glycemic Index is a number that shows effect of a food item in rising the blood glucose level. In short Glycemic Index is known as GI. A GI value of 100 is given to pure Glucose. How was Glycemic Index invented ? 1980-81 Dr David J. Jenkins was researching on foods that can be best for diabetic people. During his research he invented the term Glycemic Index and calculated it values for different food items. Glycemic Index is a simple value given to a food item, it does not take into account the amount of food consumed by a person. Therefore a related measure Glycemic Load (GL) is calculated by Multiplying the Glycemic Index (GI) of the particular food item with the amount of carbohydrate in the serving. Sometimes the GI and GL values differs a lot. For example Watermelon has a high GI but low GL for the quantity normally consumed. While Fructose has low GI, but high GL if large quantity in consumed. Glycemic Index generally depends on the carbohydrate content of the food item. If we talk about Steak, which has no carbohydrate but very high protein value, has no Glycemic Index due to absence of carbohydrate. But if it does not have Glycemic Index, it does not mean that it will not rise blood sugar level. 50% of protein in Steak can be converted to Glucose if very little to no carbohydrate is consumed with it. Therefore some nutrition experts use "Insulin Index" for food comparison instead of Glycemic Index. Insulin Index measures the amount of insulin released by our body after consumption of that food item. Glycemic Index are not considered accurate in some cases. One GI value is given to a particular food item, but in reality the variations in same food item can vary its effect on blood glucose level. The ripeness and cooking methods can easily change that value. One example of such food item is Potato, which range from very moderate to high GI value. 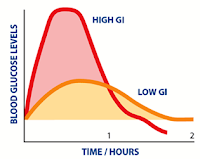 The glycemic index of a food is defined as the incremental area under the two-hour blood glucose response curve (AUC) following a 12-hour fast and ingestion of a food with a certain quantity of available carbohydrate (usually 50 g). The AUC of the test food is divided by the AUC of the standard (either glucose or white bread, giving two different definitions) and multiplied by 100. The average GI value is calculated from data collected in 10 human subjects. Usually GI is used only for foods with carbohydrates. Those foods which are rapidly digested and release glucose rapidly into blood stream have a higher GI value, while those food items which are digested slowly and release glucose gradually have a lower GI value. Therefore a lower GI value of food suggests that its slow in digestion. From past few years people have started to move away from Sugar and that place is being captured by Honey. We were told that Honey is Natural while Sugar is prepared after a chemical process. This fact matters a lot for those who want to live a better life by being close to natural products. 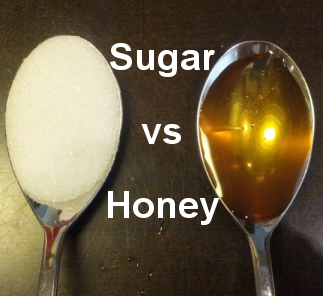 Here we will discuss if honey is really better or not, and can it be used as a sweetener in place of sugar. Both Brown and White Sugar are 100% sucrose. They are made after extracting it from Sugarcane or Beetroot. 75% of Honey is some form of sugar. Half of this 75% is Glucose and half is Fructose (this proportion varies depending on what bees are feeding on). Remaining 25% are protein, fat and fibre. Do you measure honey by a spoon ? If you take 1 tablespoon of Honey in place of 1 tablespoon of Sugar, then you are doing nothing good to yourselves. Honey is denser than Sugar. So if you really want to get benefit from Honey reduce the tablespoons to half, else the extra sugar and extra calories will get deposited in your body as fat. What is Glycemic Index or GI ? Sugar: Both White and Brown sugar have a GI value of around 65. Commercially Blended Honey: GI value varies from 45 to 64. If the Honey you are eating has a GI value above 60 then you are doing nothing good to you. GI value of Honey is directly affected by fructose level. If the bees have used more nectar of flowers then its rich in fructose and thus lower GI value. Floral Honey can be consumed by diabetic people as its effect on blood sugar is very mild. Honey can sometimes contain inactive spores of Clostridium botulinum, the tiny bacteria responsible for botulism food poisoning. Usually healthy adults can't get sick from them but infants can easily get infected. Honey is OK for kids above 1 year of age. Honey is an attractive sweetener by its better to reduce its quantity if you are on a weight loss diet. Honey can also contribute to tooth decay just like sugar. According to some researchers honey acts as mild disinfectant. It can be taken with hot water and lemon to sooth sore throat. Honey is well known for its antibacterial effect. It is used in dressing of minor wounds, skin ulcers and burns. Honey is also used as a mild laxative. Both Omega 6 and Omega 3 belong to the group of PUFA (Poly Unsaturated Fatty Acids). These fatty acids are necessary for good health of a human being. But Omega 6 and Omega 3 have some different properties. We will discuss these facts here help you understand some basic differences between these two fatty acids. According to some researches the ratio of Omega 6 to Omega 3 in the diet of our non-vegetarian predecessors was 1:1. It means similar quantity of both Omega 6 and 3. But as we move from non-veg to veg diet and soon started to use vegetable oils, this ratio changed dramatically. Now a days 4:1 ratio of Omega6 : Omega 3 is considered best. But its far away from actual measurements. Ratio of Omega 6 to Omega 3 in American diet changed dramatically during past century. In 1930s this ratio was 8.4:1, while in 1985 it was reported to be 10.3:1 . Today this ratio ranges from 10:1 to 20:1 , which is very dangerous for human body. Here we are not demonstrating in depth chemical reactions done by Omega 6 and Omega 3 in our body. The basic thing is that Excess of Omega 6 increases inflammation. Omega 3 is neutral. If you eat omega 3 then lesser amount of Omega 6 will be available to tissues. Diet with more Omega 3 and less omega 6 will reduce inflammation. 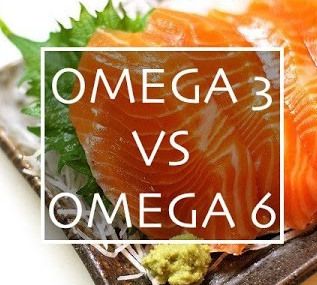 So if you want to reduce any type of inflammation in your body then just reduce Omega 6 and increase Omega 3 in your diet. If you want to know which inflammatory diseases you can get due to higher amount of Omega 6, then these diseases are Obesity, Type 2 Diabetes, Auto Immune Syndrome, Rheumatoid Arthritis, Cancer, Asthma, Inflammatory Bowel Disease and Psychiatric Disorders. Most of the US population is at high risk of Heart Diseases due to high Omega 6: Omega 3 ratio. According to a research if this ratio is reduced to 4:1 then mortality can be reduced by 70%. Its clear by these researches that Omega 6 has played a major role in evolution of modern world killing diseases like diabetes and heart diseases. Amount of Omega 6 and Omega 3 found in various vegetable oils is shown in the table below. A few studies have shown that in last 150 years heart diseases have increased at a high rate. Similarly ratio of Omega 6 compared to Omega 3 has also increased. Studies have found a direct relation between Omega 6 and heart diseases. That’s why Omega 3 is suggested to heart patients to reduce the effect of Omega 6 on their body.